If you’re thinking about hiring a freelance editor, you’ve probably got a few questions. Which genres are your specialties? I am well versed editing in most genres, but I gravitate toward mainstream/literary fiction, short stories, and narrative nonfiction (memoir and essay). My first love is historical fiction! I'm writing a science fiction manuscript. Can you edit it? Sure! I have edited a wide variety of styles and genres. Some genres have certain plot arcs and character types. I keep these elements in mind as I edit, always considering the reader’s expectations for that genre. That said, there are some types of writing I do not edit. I do not edit poetry, textbook material, technical writing or scripts/screenplays. What types of editing do you handle? I don’t have the entire manuscript finished. Will you edit a partial manuscript? It depends. Many writers find it helpful to get a partial critique—usually an outline and the first 10,000 words. You may also be interested in one-on-one coaching for more in-depth guidance. Send me a message and let’s chat. I’d love to learn a bit more about your project! Turnaround time varies greatly depending on the length and scope of the work and what projects are in the queue ahead of yours. I will give you a specific time frame before I begin editing. I accept payments through PayPal, through which you can use a major credit card or bank transfer. I will send a PayPal invoice for a 50 percent down payment as I begin the project with the balance upon completion. You don’t need a PayPal account. Your payments can be processed as a guest transaction. If you’re not in the US (where I am), no worries—PayPal makes the necessary currency conversions. After you submit your manuscript via email attachment (Word document preferred), I’ll get right to work! For content or developmental edit, you’ll receive an in-depth report (usually about 5-7 pages) with an in-depth review about what is working and what needs your attention. 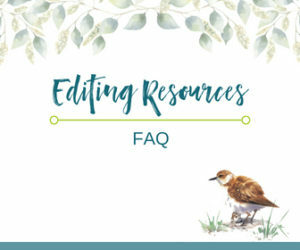 If you have any questions about my feedback or edits, I’m here for you! I want to help you make your project the best it can be. In short, yes. Your work will be treated with the highest ethical standards. I will not show your work to anyone else without your permission. I don’t keep copies of your work after my services are completed. Can you help me find an agent or publisher? No. That’s really out of my area of expertise. Check out The Association of Authors’ Representatives, Publisher’s Marketplace or the Writer’s Market for listings of agents and publishers that might be suitable for your project. Please drop me a line through the contact form and we can chat about what options might best suit you. Have a question that wasn’t answered here? Send me a message!